Slate is a foliated metamorphic rock and has known to be used since the ancient Roman era. Some of its striking properties like water resistance, fire resistance and durability make this natural stone a great choice for construction. Available in a variety of shades, designs and colors; this stone is extensively used for wall cladding, flooring, flagging and roofing. Natural slate stone chiefly consists of micas or clay minerals that depend on the intensity of metamorphism to which it has been exposed to. With increase in the level of pressure and heat, the clay minerals in the shale transform to micas. Like other natural stones, slate shares a number of environmental-friendly characteristics, such as durability, ease of care, low-cost maintenance and enduring life cycle. Architects and designers use natural slate stone both for exterior and interior applications. Exterior applications of slate include landscaping, roofing, copings and sills, paving, cladding and wall covering. For interior installations, it is used as wall and floor tiles, fire surrounds, worktops, hearths, and even tableware and house signs. Heat and water resistance properties make this stone a great material for roofing, while high performance, durability and low-cost maintenance are responsible for making it apt to create cladding panels. A lot of time and resources are invested in the exploration, extraction, processing and installation of slate. The exploration process starts only after mineralogical, geological and geotechnical surveys are conducted. The samples are further taken to test for the quality and potential deposits of the stone. Periodic surveys are also conducted in order to prepare the quarry for steady and consistent production in the future. The extraction is done either from open quarries or underground mines. Sawing: Large blocks, extracted from quarries, are sliced into varied sizes as per the requirement. Shaping: Every slate block is manually cut into sheets with utmost care and attention. Water is applied whenever necessary to prevent drying and also to promote exfoliation. 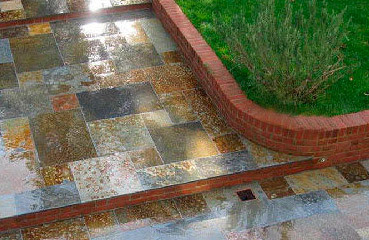 Finishing: Several methods are employed to bring out the desired finish on the surface of the natural stone product. Beveling: This step includes beveling the edges of the product (tile, etc.) that helps the water to pass through the surface easily when the slate is placed on the roof. Available in amazing textures and colors, natural slate not just boost the value and décor of any property, but gives you a wonderful feeling of being close to nature.